So a sampler's just for playing back audio, right? Wrong! If you aren't getting the most out of today's super-powerful samplers, then the brand-new Computer Music Sampling Special is aimed right at you. 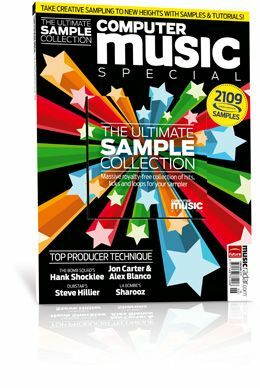 It's packed with everything you need to inspire your sampling creativity to new and exciting heights. Firstly, there's the covermount disc - a DVD packed to overflowing with over 2,100 samples all culled from professionally produced collections and bought to you by uber-sample legends Time+Space. Expect lots of loops, licks, hits and stabs. Secondly, there are over 50 pages of in-depth tutorials and techniques from supreme samplists including Bomb Squad's Hank Shocklee, Alex Blanco and Jon Carter, Dubstar's Steve Hillier and La Bombe's Sharooz. Plus there are interviews with some of the greatest creative samplists of all time, including Bomb Squad's Hank Shocklee, Coldcut's Matt Black, Scanner and Tim Exile.